As I start to write this, I have 17 minutes left of the one year publication anniversary of Once Upon a Rhyme. With the possible exceptions of Umbra: The Velvet Shadow (my first major roleplaying book) and Sons of Fenris (my first published novel), nothing has had a larger impact on my writing life. Since that day, I’ve been a guest at the New York Comic Con, a guest at my local game and sci-fi/fantasy convention RavenCon, had a sequel published (Happily Never After) and written a third book, Pitchfork of Destiny. I’ve had other works at least be considered in the office of a major publisher, and it appears likely that I’ll have a new series start in 2016. And on August 25, 2015 , Jack Heckel has another book – A Fairy-tale Ending! And that’s the one that I want to warn everyone about. If you own Once Upon a Rhyme and Happily Never After, please DON’T buy that book! It is a collection of those two books together in one place, and hopefully in a month or two, it will be released in paperback. I just don’t want anyone getting confused and thinking that it’s the third in the series. That will be Pitchfork of Destiny coming in December. However, if you know someone who hasn’t read the series, please recommend A Fairy-tale Ending, because it contains both books, and a cool map along with some additional editing. If they haven’t started the series, it’s a good way to be caught up on everything. I guarantee that they will laugh. I feel like I have a million things to do and no time to do any of them. After having Happily Never After published, I’ve spent time trying to coordinate all the social media aspects of publication. I’ve been working on interviews and trying to do tweets and checking in on Facebook. I’ve been attempting to keep up with my email, although I’m getting overwhelmed by holiday messages. It’s been a mess. And it’s not even been two weeks. I think it’s amazing the speed at which the world works. There are so many opportunities for writers to promote and market themselves, but no one really seems to know the magic formula to get your work in front of your audience. There are lots of theories and probably a half billion people on the internet who’d offer to help, but as far as I can tell it’s just hard work. I spent most of this weekend working on a Christmas Pageant script, doing holiday related activities, prepping for this week at my day job, and trying to find time to get household chores done. It was largely successfully, however, I fell behind on my own Book 3 deadline schedule for Charming as well as blog posts. Bishop O’Connell told me that the real work begins after publication. I thought I knew what he meant after Once Upon a Rhyme, but it’s a lot more with Happily Never After‘s release. That’s a good thing, by the way, but it’s still crazy. I suspect that as long as I keep taking it one piece at a time, everything should work out. In the midst of the excitement of Nanowrimo (and yes, I have a lot more to post on that including more Freedom Squad), I had a book release! On November 25th, the sequel to Once Upon a Rhyme, Happily Never After, was published as an ebook. It’s available on Kindle, Nook, iTunes and of course, Harper Voyager’s own website. I’m extremely pleased to have the sequel out within a few months of the first book. In this book, the story started in Once Upon a Rhyme comes to its conclusion. We’ve been compared to The Princess Bride and Shrek by reviewers, which pleases me to no end, as that’s exactly what we were hoping for. If you enjoyed the first book, I’d love to know what you think about Book 2. I’m hopeful that in a time where Into the Woods is coming out as a movie and Once Upon a Time is on television, that these two books will be ones that people can discover and enjoy. Wishing everyone the best! First off, thank you all for purchasing Once Upon a Rhyme and for all the reviews and feedback and shares on the internet. Since it was published last Tuesday. 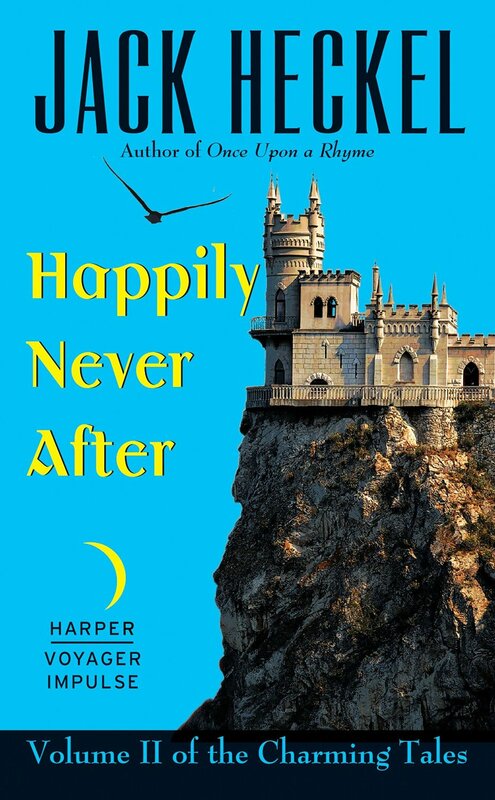 I’ve written answers to interview questions, worked on marketing and social media (though neglected my own blog), and I’ve been involved in edits on Happily Never After. Both John and I are doing our best to make sure that the sequel is out early November. A special shout out to Kyran and Cathy for their Amazon reviews! Thank you both!! When John Peck and I originally started writing the books which became The Charming Tales, we started with an outline that we both agreed upon. I remember being very excited about beanstalks, geese that could lay golden eggs, witches who lived in gingerbread houses and how our two main characters would deal with all of them. And as we wrote, all of those exciting ideas blew away like a straw house facing off with a big bad wolf. Our characters, particularly Liz Pickett and the rescued Princess Gwendolyn, suddenly took the plot into their own hands. We realized that we couldn’t write the book and follow the outline. The characters wouldn’t let us. We had too many questions about what they would do, and we both discovered that we were much more interested in what would happen to them than what would occur in our original plot. I’ve written on a few occasions about my grandfather, Dr. Harry L. Heckel Jr. (“Captain Heckel”), the oldest man to perform a solo circumnavigation of the globe. I still owe him a page on this blog. He always encouraged me to pursue my dreams. He would push me to do more writing, and he reminded me more than once that life was shorter than I thought. In fact, he told me that life was short on the day he died. When I took the afternoon off work to go see him that day, I had something to tell him. At that point, contracts hadn’t been signed and I wasn’t supposed to talk about it, but I had received the offer on The Charming Tales. He had been having a difficult week and everyone thought the end was near. So on his last day, I was able to tell him that I had gotten a book deal with Harper Voyager. Charming is the last thing we talked about, and I’m so thankful that I had the chance to share it with him.